The world in the 21st century is facing a demographic revolution; better nutrition, advances in healthcare, and the rise of smaller family units have created a hitherto unseen demographic explosion. The large demographic grouping of people 65 and older is now under pressure due to the many healthcare concerns that their venerable age brings with it. One of the main issues facing them is transportation. The issue may seem banal at first, but it becomes increasingly alarming when considering that the people concerned have special needs, such as wheelchairs, oxygen tanks, or cognitive issues. How do you get a person with reduced mobility up the stairs to a doctor’s office? How about a person suffering from a mild form of dementia who might not even remember where they are? It’s not just a matter of finding a willing driver or calling a cab. These people are in need of trained professionals that can help transport them from A to B and deal with any eventualities on the way. Also, there’s an increasing need for specially adapted vehicles and equipment that can help transport these fares toward their destinations. The need is rapidly becoming one of national import. According to a report by SCI Solutions, up to 30% of all medical appointments are canceled due to lack of transportation. Each cancellation costs doctors $200 per appointment. Meanwhile, the healthcare industry is losing $150 billion in revenue each year to no-show patients. This is without taking into account the steady deterioration of health and quality of life this fragile, at-risk group faces. Their precarious health and lack of transportation mean that health issues tend to accumulate, leading to potentially dangerous situations. This has created a massive niche in the market for transporting seniors and/or disabled people. Creative solutions are increasingly coming to the fore to address the situation. Many startups have successfully made transporting this fragile demographic their main objective. Companies like TenderCare, RoundTrip, and Circulation Inc. provide non-emergency transport for the elderly and people with disabilities. Operating in different states, with different business plans, they nonetheless share several common denominators. They’re all innovative in their conception, flexible in their approach, and incredibly successful economically due to an ever-growing demand and customer satisfaction. Though many people try to take advantage of the elderly, these companies are doing what they can to make their lives a little easier. According to Mark Switaj, founder and CEO of Roundtrip, their no-show patient percentile is less than 4 percent, proving the efficacy of these new transportation platforms. The high demand for their services and the readily available clientele is also a factor in the successful expansion of these startups. 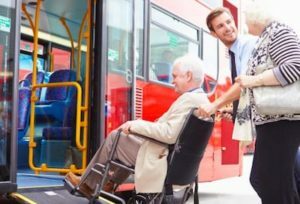 Though the elderly and disabled tend to be the main beneficiaries of this new revolution in transportation, other groups are profiting from the opportunity as well, such as cancer patients, recovering drug addicts, physical therapy patients, low-income patients, and parents of children with disabilities. Another feature that helps explain the success of these companies is their proficiency online, and the way in which they are organized. Closely resembling Uber in their organizational and online presence, these companies have created user-friendly platforms, which has helped to cut down on costs and increase efficiency. Such new transport platforms are improving their services and are expanding rapidly to serve the needs of their ever-growing clientele. With new services appearing every day, Circulation Inc. is planning to expand into prescription transport, medical equipment, and even has plans to work with laboratories to transport their collections. The future looks bright for the non-emergency transport industry as society has embraced this new model of transportation. Contact your Professional Care Manager for information on non-emergency transport options in your area.